Scott at Bitnotic sent us word about their new generative ambient music application, chill. The concept of generative music – popularized by Brian Eno – is that complex music can be created by setting relatively simple processes into motion. You can think of chill as a royalty-free music generator. 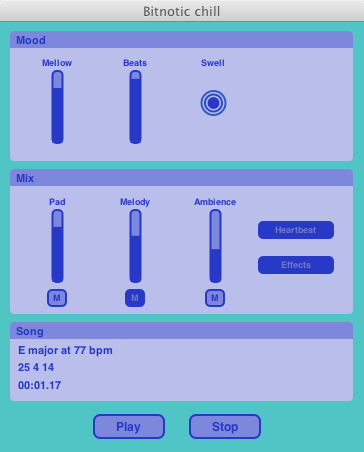 It uses generative music processes to create new music in an ambient/chill-out style. Songs created by chill can be saved in AIFF, Wave, and MIDI formats. Songs are royalty-free and can be used in podcasts, video productions, and record albums without further licensing. You can also use chill MIDI files as the basis for compositions in digital audio workstations such as Apple’s Logic. Bitnotic is actively seeking feedback on the public beta. The company is holding a contest where the three best comments/suggestions/bug reports will win free licenses to the final product. Details are available on the Bitnotic web site. You can preview an example of chill’s output below. Then download it and give it a try. chill 1.0 will retail electronically for US $19.95. Fudge … only works on Macs. You might have mentioned this thing is Mac only. Nice and slow. One can readily weave its sound into other things. Those cuts on BumperTunes sound like they were engineered to be either podcast intros or music beds for podcasting, eh? Not sure, but a lot of them sound like they’re meant to be used for show intros.